While it's no secret that babies cry, when your newborn seems to cry endlessly everyday it can begin to wear even the best of parents down. Even though you have tried everything you can think of to calm your little one down, nothing seems to work. When your healthy and well-fed newborn regularly cries for extended periods of time at least three hours a day, three or four days a week, there's a good chance you've got a colicky baby on your hands. Colic usually begins when your newborn is between two and six weeks old and continues until they are three months. Colicky babies tend to have a harder time sleeping and they are more likely to be constipated. Anywhere from 15% to 20% of all newborns are affected by colic. The crying tends to be the worst in the evening than at any other time. When a newborn with colic cries, they tend to draw their arms and legs tightly into their bodies. Their face will be bright red and they may pass a lot of wind. The painful appearance of a colicky baby can be very upsetting and frustrating to parents since there is little they can do to relieve their baby's discomfort. However, colic is not harmful to a child and does not cause them any pain. Unfortunately, experts have never been able to find a particular reason for colic. It has been speculated that gastrointestinal problems may be one cause but most agree that, while abdominal gas can definitely contribute to colic, it is not a cause of it. 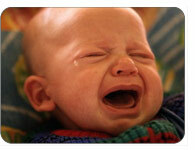 Another possible cause of colic is a combination of a baby's temperament and a nervous system that is a bit immature. Some baby's happen to be a bit more sensitive to their surroundings causing them to cry more easily. If their nervous system is still slightly undeveloped, then they may not have the ability to stop their tears just yet. It has been found that mothers who smoke, had a long labor, needed an epidural or required forceps during their delivery are more likely to have a colicky baby. Just as no cause has been pinpointed, neither has a cure for colic been miraculously discovered (although many parents have prayed endlessly for one to be found). Evidence suggests that, as babies learn to soothe themselves and develop better social skills, their colic tends to ease up and disappear. However, since that may take a few months, there are some other tricks you can try that can help you cope. If you are bottle-feeding your newborn, you may want to try switching formulas. You may also want to try changing from a cow's milk-base to a soy-base in the formula as many babies have troubles digesting the lactose found in milk. If you are breastfeeding, a change in your diet may help relieve some of your baby's tears. Try cutting out beans, onions, garlic, apricots, cabbage, broccoli, cauliflower, spicy foods and caffeine and then gradually reintroduce the foods. You may also want to try cutting out cow's milk as the lactose in it could cause your newborn to have some troubles digesting your breast milk. Colicky babies often pass a lot of wind. To help relieve some of the excess gas pent-up inside of them, try burping them frequently. You may also want to try different feeding positions and different types of bottles that reduce the amount of air your baby takes in when they are feeding. You can also try some tried and tested soothing tricks, like taking you baby for a ride in the car, walking around the house with them, or gently rocking with them in a rocking chair. If you are concerned that your baby's constant crying may be caused by something other than colic, it may be a good idea to make an appointment with your family doctor or pediatrician. But how do you know what is normal for a colicky baby and when something might be a bit more serious? First, ensure that your baby isn't crying because they are hungry, tired, or uncomfortable because of too much or too little clothing. Next, make sure you are cuddling your baby enough. Babies require a lot of attention and affection so be sure to lavish it upon them. You should also check that your baby isn't crying because something has startled them or because a diaper rash or some other type of common problem is causing them discomfort. When you do go the doctor's, be sure that you know when your baby cries, when they eat and when they sleep. You will also want to know the pattern of their bowel movements. While your child's doctor may just confirm that they have colic, at least you will know that there are no serious underlying medical issues. Being a parent to a colicky child can be incredibly stressful. Putting up with your child's constant crying for long periods of time can easily fray the hardest of nerves. Since a parent's natural reaction is to want to ease their child's tears, your inability to do anything to ease the tears can be incredibly disheartening. Before it all gets to be too much, ask a friend, neighbor, or relative to look after your newborn for an hour or two. Even if they can only spare a half hour, take advantage of it. You need a break every once in awhile. Need some advice on pregnancy or baby? Chat with other new moms! Find out more about how to deal with babies with colic in our baby forum.